Woo-hoo! Crash bang boom. Sarcasm, arrogance, and macho bravado. A little plot, a funny twist, hero shows his personal side, then add in the special effects and you have 130 minutes of eye catching 3D entertainment. Marvel comes through marvelously. Yes, it's a comic book but don't we all still retain a bit of that comic book kid well into adulthood? Don't look for this to winning any Oscars for artistic direction or messages of great profundity. This is pure unadulterated kids' fun. It's the empty calories of fast food but if you're going to eat empty calories, it's nice to have delicious empty calories. Robert Downey Jr. is back, baby, and Tony Stark (Or is it Tony Snark?) is at his arrogant best. The success of an over-the-top superhero movie is that it doesn't take itself too seriously. That played well with the 2012 film The Avengers with no small credit going to the character Iron Man himself. But lets give credit where credit is due and any film starts with a story. Here that story was co-written by Shane Black who was also the director. Mr. Black seems to have a recognisable career in screenwriting having authored such films as Lethal Weapon, The Last Boy Scout, Lethal Weapon 2, and Last Action Hero. Gee, according to Wikipedia, Black got $1 million for the screenplay Last Action Hero and $1.25 million for The Last Boy Scout. I had no idea screenwriting could be that lucrative. Bring home one of those babies once a year and colour me impressed. The plot? Does anybody really care? Marvel seems to be going great guns with Iron Man. It was all in good fun. Nothing profound. For anybody wanting good craftsmanship, this is a good film. For you diehard fans, you'll love it. It's funny. I saw the film a week ago and started writing this review but then couldn't think of anything to say. Ha ha. 78% on Rotten Tomatoes. That says it all. Two hours of decent entertainment. 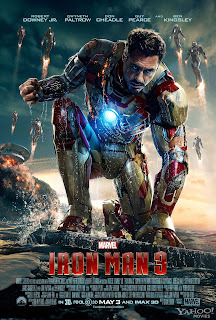 Iron Man 3 (stylized Iron Man Three onscreen) is a 2013 American superhero film featuring the Marvel Comics character Iron Man, produced by Marvel Studios and distributed by Walt Disney Studios Motion Pictures. It is the sequel to Iron Man and Iron Man 2, and the seventh installment in the Marvel Cinematic Universe, being the first major release in the franchise since the crossover film The Avengers. Shane Black directed a screenplay he co-wrote with Drew Pearce, which is loosely based on the "Extremis" story arc by Warren Ellis. Jon Favreau, who directed the first two films, serves as executive producer, along with Kevin Feige. Robert Downey, Jr. reprises his role as the title character, with Gwyneth Paltrow, Don Cheadle, and Favreau reprising their roles as Pepper Potts, James Rhodes, and Happy Hogan, respectively. Guy Pearce, Rebecca Hall, Stephanie Szostak, James Badge Dale, and Ben Kingsley round out the film's principal cast. Director Jon Favreau and star Robert Downey make this smart, high impact superhero movie one that even non-comics fans can enjoy. Iron Man is a 2008 American superhero film based on the Marvel Comics character of the same name. 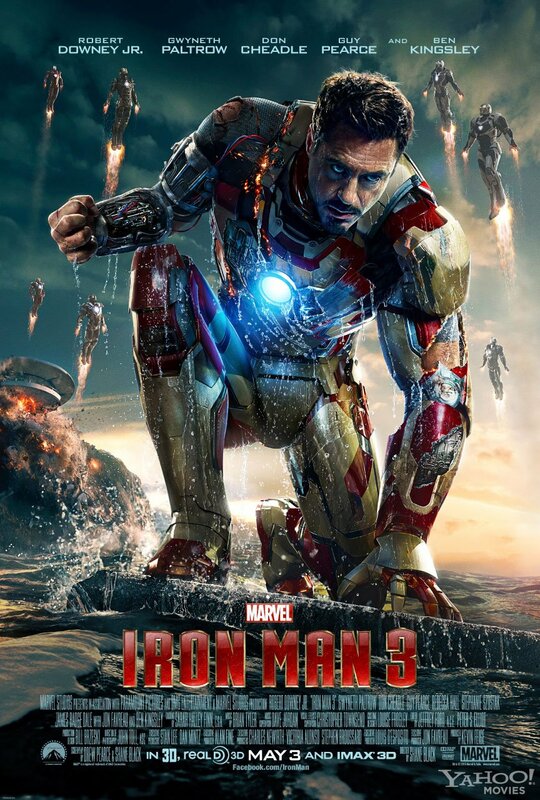 It is the first installment of the Marvel Cinematic Universe and the Iron Man film series. It isn't quite the breath of fresh air that Iron Man was, but this sequel comes close with solid performances and an action-packed plot. Iron Man 2 is a 2010 American superhero film based on the Marvel Comics character Iron Man. Iron Man is a fictional character, a superhero who appears in comic books published by Marvel Comics. The character was created by writer-editor Stan Lee, developed by scripter Larry Lieber, and designed by artists Don Heck and Jack Kirby. He made his first appearance in Tales of Suspense #39 (March 1963). Shawarma VIDEO: After the Avengers save the planet and Iron Man is nearly killed, Tony Stark mentions going to get Shawarma. Funny enough, eh? At the screening I go to, everybody got up and left during the credits but at the end, the very end of the credits, there was an absolutely hilarious scene where the Avengers are all sitting around a table in a fast food outlet eating Shawarma. For a full thirty seconds, they all sit there eating and not a single one of them utters a word. I killed myself laughing. The following dialogue generated quite a fuss with people who took exception to this attempt to find humour in the fact that Thor's brother Loki is adopted. Bruce Banner: I don't think we should be focusing on Loki. That guy's brain is a bag full of cats. You can smell crazy on him. Thor: Have care how you speak. Loki is beyond reason but he is of Asgard. And he's my brother. Black Widow: He killed 80 people in 2 days.